Le Four des Banes is a country house built in the XVIII century, located on a rural track, which was at that time the main road to the Alps. The house has an old stone oven, picturesque and unique, where farmers and village people came around once, to bake their bread. The place consisted of two rooms, a barn and a chicken coop built with dry stone. It has been completely renovated and enlarged to become a warm and modern guest house, while keeping the spirit of Provencal architecture. The house is located 3 km from the center of Aix en Provence, yet in the countryside, but close to highways. It is at the crossroads leading to the Alpilles, the Luberon or the Gorges du Verdon and nearby the first trails to the Montagne Sainte-Victoire. Simplicity in style and choice of objects, mix of wood, wrought iron and old stones, Here, everything has been designed to provide comfort and usability. The main room is full of light thanks to large windows and invites guests to enjoy a moment of tranquility and privacy. In the kitchen stands the old oven, centerpiece of this authentic place where guests can choose to take their breakfast. 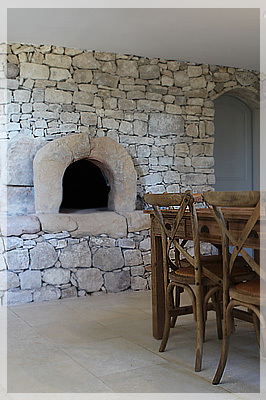 Breakfast can be served in the dining room or directly in the kitchen, near the old oven. From the month of May, it is possible to take on the terrace in the shade of a huge centenary pine. Come to have breakfast ! Pool and sun await sun seekers from May to September. A garden is at your disposal to extend your day comfortably. Continue your visit and discover what this authentic place.